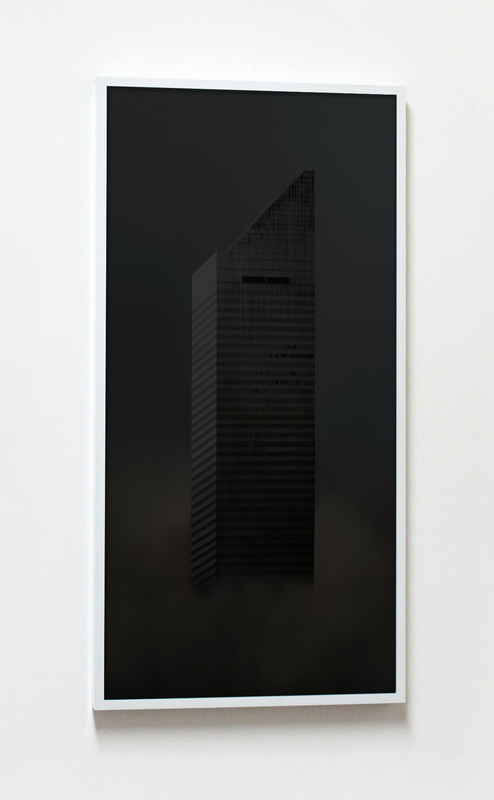 Luke Barber-Smith's tower series is a continuing investigation into the emotional language of architecture. Built from steel, photographic prints and magnets, the towers are a study of color and form, both in relation to a modern structure of larger proportion. The photographs in tower study #2 (2013) are a document of decaying glass windows, each one a unique, isolated surface. The accompanying photograph, Slope (2014) depicts a notable New York City building as a portrait. Crowned with stains and broken glass, the high-rise has a unique physical vulnerability and presence. Luke Barber-Smith was born in 1981 in Philadelphia, Pennsylvania and lives and works in New York. Recent exhibitions include 'HINDSIGHT' at V1 Gallery, curated by Peter Funch, Copenhagen DK, 'AON Center' at Primetime Gallery, Brooklyn NY, 'E.A.F.' at Duve Berlin DE, 'Battery TUNNEL' at Primetime Gallery, Brooklyn NY, and The Kings County Biennial, Brooklyn NY, curated by James Fuentes.